SAINT JOHN - Fans witnessed a rare basketball double-double at Harbour Station Friday night, a close shave and a resounding victory. 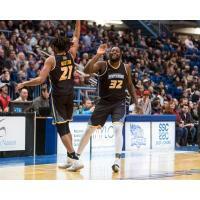 On a night when Mayor Don Darling had his head shaved in front of 5,000 fans, the Saint John Riptide cruised to a 96-76 win over the Moncton Magic in National Basketball League of Canada action. "It was a lot of fun. The fans were great and the environment in here was fantastic," head coach Nelson Terroba said following the game, dubbed the Battle of 506. "I thought Darnell Landon had a big game for us. He was ready and he's been patient. I also thought Jon Harris stepped up. He's a really good shooter and he just hadn't got it going. But tonight he did, which is big for us because it opens up the floor." T.J. Maston led the 'Tide with 20 points while Frank Bartley added 19. Landon came off the bench to score 12 for the Riptide, who have won seven of their last 10. Brent Arrington, playing with family in attendance, added eight points to complement his 10 assists. Harris scored nine points on 3-5 shooting from beyond the three-point arc. "We're gaining our rhythm now. We're learning how to play with each other," Landon said following the win. "We're young so it took some time. But we're getting it going now." With the win the Riptide improve to 15-19 while the Magic fall to 20-12. The 'Tide played minus super sub Kemy Osse who was placed on the reserve list Thursday with an injury to his left arm. The Montreal native is eligible to return to the lineup for next Wednesday's home matchup against the Magic. Osse's spot on the roster is being filled by forward Kazembe Abif, who did not dress for Friday's contest. Moncton were without injured starters Billy White and Nick Evans. The Riptide led 78-53 after three quarters. Saint John took a 46-38 advantage into the break. The 5,000 fans were treated to a hair-raising experience at half as Darling, a season-ticket holder, made good on his promise to shave his head if the team hit that attendance mark. The 'Tide led 18-12 after a very physical first quarter. The Riptide are back in action Saturday night when they face the Kitchener-Waterloo Titans at 7 p.m.